This item is no longer available for sale on this site. As the first black female television journalist in the western United States, Belva Davis overcame the obstacles of racism and sexism, and helped change the face and focus of television news. Now she is sharing the story of her extraordinary life in her poignantly honest memoir, Never in My Wildest Dreams. A reporter for almost five decades, Davis is no stranger to adversity. Born to a fifteen-year-old Louisiana laundress during the Great Depression, and raised in the overcrowded projects of Oakland, California, Davis suffered abuse, battled rejection, and persevered to achieve a career beyond her imagination. Davis has seen the world change in ways she never could have envisioned, from being verbally and physically attacked while reporting on the 1964 Republican National Convention in San Francisco to witnessing the historic election of Barack Obama in 2008. Davis worked her way up to reporting on many of the most explosive stories of recent times, including the Vietnam War protests, the rise and fall of the Black Panthers, the Peoples Temple cult mass suicides at Jonestown, the assassinations of San Francisco Mayor George Moscone and Supervisor Harvey Milk, the onset of the AIDS epidemic, and the aftermath of the terrorist attacks that first put Osama bin Laden on the FBI’s Most Wanted List. She encountered a cavalcade of cultural icons: Malcolm X, Frank Sinatra, James Brown, Ronald Reagan, Huey Newton, Muhammad Ali, Alex Haley, Fidel Castro, Dianne Feinstein, Condoleezza Rice, and others. Throughout her career Davis soldiered in the trenches in the battle for racial equality and brought stories of black Americans out of the shadows and into the light of day. Still active in her seventies, Davis, the “Walter Cronkite of the Bay Area,” now hosts a weekly news roundtable and special reports at KQED, one of the nation’s leading PBS stations,. In this way she has remained relevant and engaged in the stories of today, while offering her anecdote-rich perspective on the decades that have shaped us. Belva Davis currently hosts This Week in Northern California on San Francisco’s KQED. She has received eight local Emmys and many other awards, including honors from the International Women’s Media Foundation and the National Association of Black Journalists. Vicki Haddock is a journalist and was a senior writer at the San Francisco Chronicle as well as a reporter and assistant city desk editor for the San Francisco Examiner. "This fascinating book is a must-read for all and a welcome addition to the history of journalism." 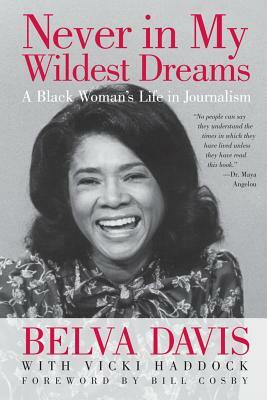 "She clawed her way into the white male-dominated news industry, climbing her way up despite the most unlikely of profiles: black, female, short of stature, equipped with a soft voice and no college degree, for years herself a single mother.....As a woman and an African-American, Davis said she always felt the pressures of blazing a trail for others. She constantly worked to master her emotions, in order to present the public face of the consummate professional newswoman— confident, imperturbable and scrupulously objective. Inside, she was afflicted by hurts and humiliations, fears and anxieties that she could never let show....Her memoir, written with political journalist Vicki Haddock, is both a personal narrative and a modern political history of the Bay Area, California and, at times, the nation." "With bracing candor, Belva Davis shares the story of her extraordinary, gutsy, against-all-odds journey from a poor chaotic upbringing in Louisiana, through the pioneering days of TV journalism, to the respected position she occupies today. Meet a truly remarkable woman."